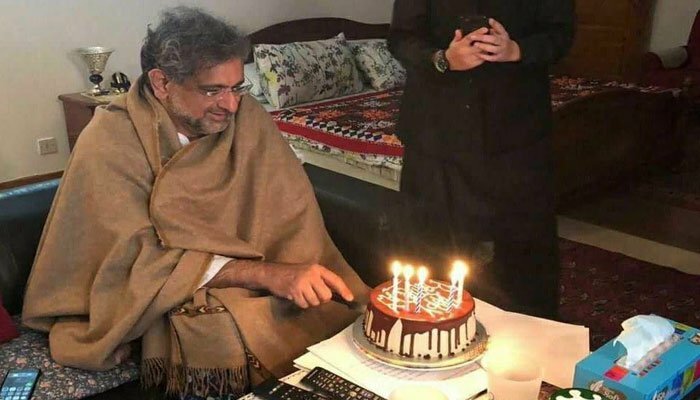 Prime Minister Shahid Khaqan Abbasi has won several hearts after a picture of him cutting cake on his birthday was widely shared on the internet. The prime minister, dressed casually in a shawl wrapped around, is seen cutting the cake in the image. The picture has drawn quite a positive reaction from the masses, who have hailed the humbleness of the premier. He was born on December 27, 1958. Earlier this year, he was sworn in as the 18th prime minister of the country on August 1, following Nawaz Sharif’s disqualification by the Supreme Court in the Panama Leaks case. Abbasi, a businessman who launched the country’s most successful private airline, has formerly served as federal minister for petroleum and natural resources. Educated in the US at George Washington University, he was born in Karachi but is a member of the National Assembly from Murree. Abbasi worked in the US and Saudi Arabia as an electrical engineer before joining politics after his father, a minister in General Zia´s government, was killed when an ammunition dump exploded in Rawalpindi in 1988. Abbasi has been elected six times as a member of the National Assembly since then and has previously served as minister for commerce and defence production. He was also the chairman of Pakistan International Airlines (PIA) from 1997 to 1999, until General Pervez Musharraf overthrew Sharif’s second government.